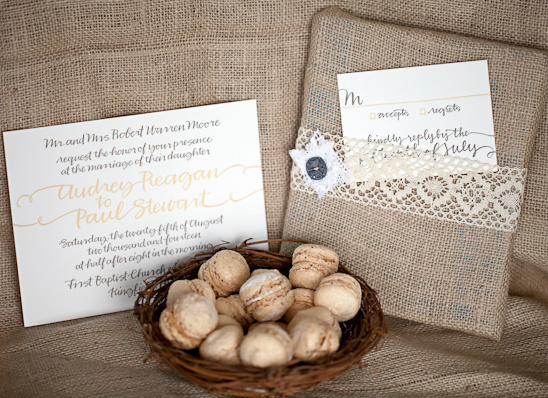 Here at The Wedding Chicks we relish in sharing wedding inspiration with you. Whether it's a food truck wedding or how to make meringue parfaits for your dessert table. We adore it all. 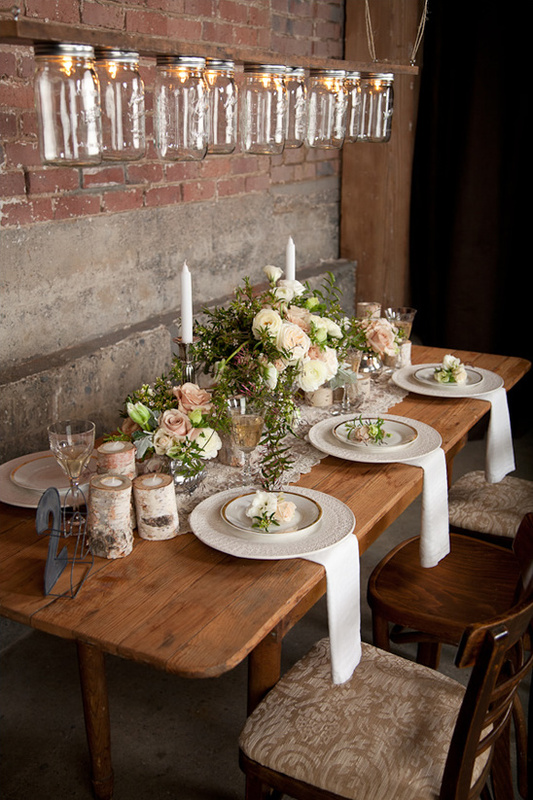 Needless to say we are super excited to share today's elegant rustic wedding ideas from a few of Seattle's finest wedding vendors. 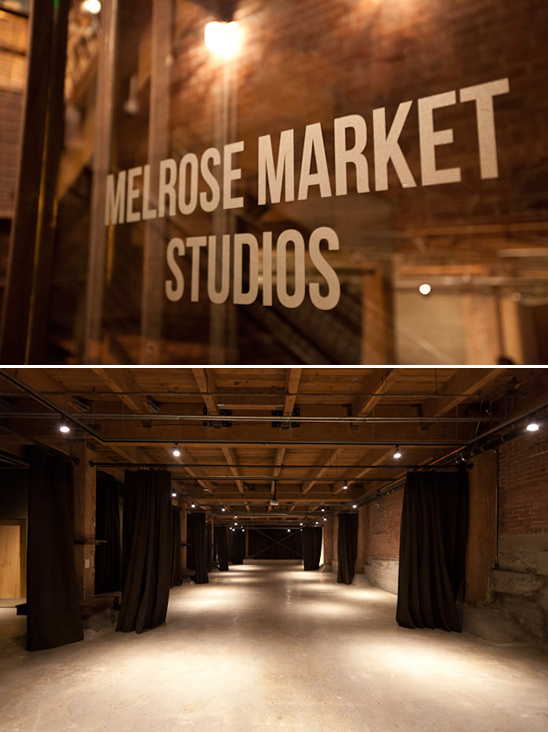 With the brick walls and exposed beams of the fabulous Seattle wedding venue Melrose Market Studios as the background, they created a soft and romantic look all inspired by Chrissy Wai-Ching’s stunning ruffled wedding dresses. 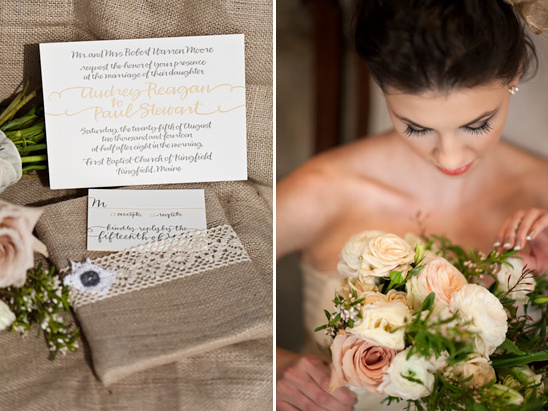 Impeccably styled by Finch & Thistle Event Design and photographed by Abbey Hepner Photography. 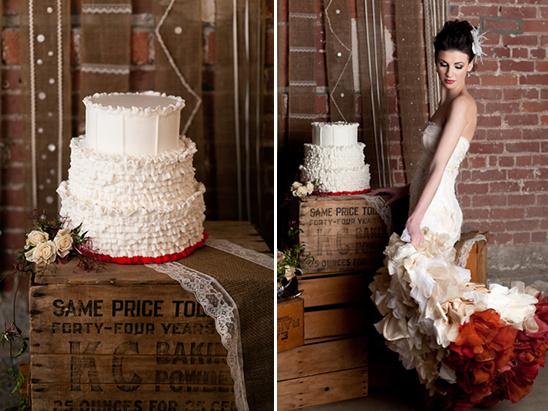 So many more ombre dresses and rustic wedding ideas to see in the full gallery by clicking here. 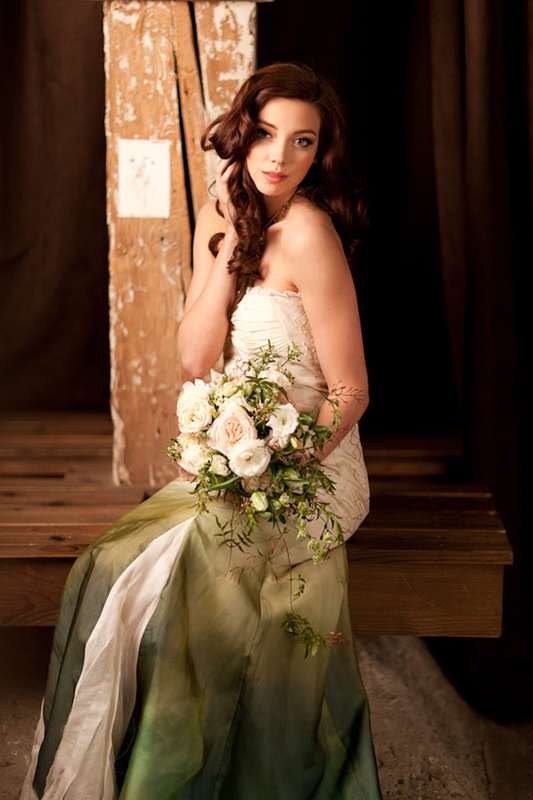 When Abbey contacted me about styling the shoot, I knew I wanted the flowers to be very soft and romantic to contrast with the industrial feel of the space. 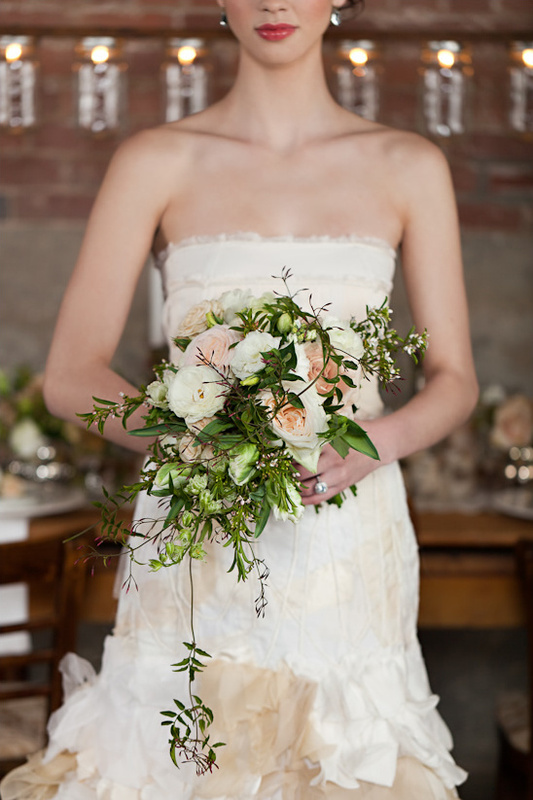 I created a loose, cascade style hand-tied bouquet in a soft pastel color palette with garden roses, ranunculus, orange blossom, parrot tulips and jasmine. The jasmine trailed beautifully leading the eye to the dramatic skirts of the wedding dresses and the deep pinky-red color of the jasmine’s buds also mimicked the color of the hem. For the tabletop, I used Vintage Ambiance’s silver teapots and jugs instead of vases for the satellite arrangements and a vintage mercury glass urn for the centerpiece. 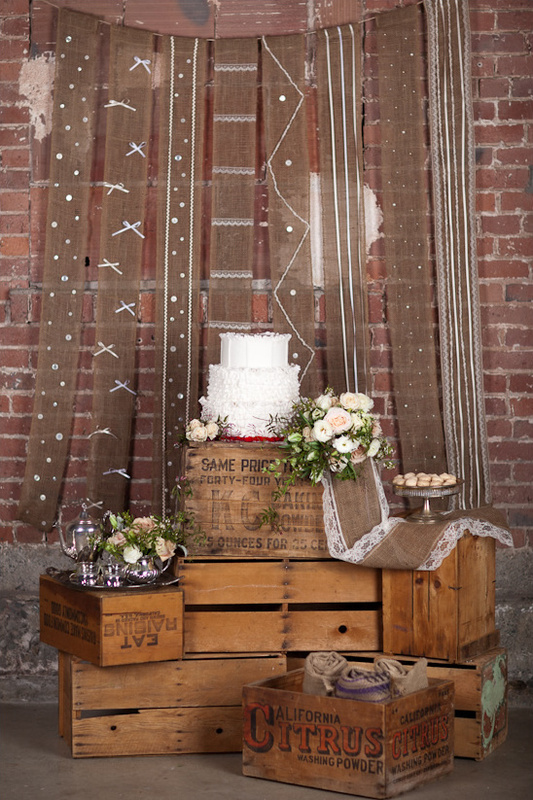 A vintage lace runner was a romantic touch and didn’t hide the beautiful wood table. The flowers coordinated with the bouquet and I created small boutonnieres tied with twine for each place setting. The birch votive holders brought the outdoors inside and softened the look. 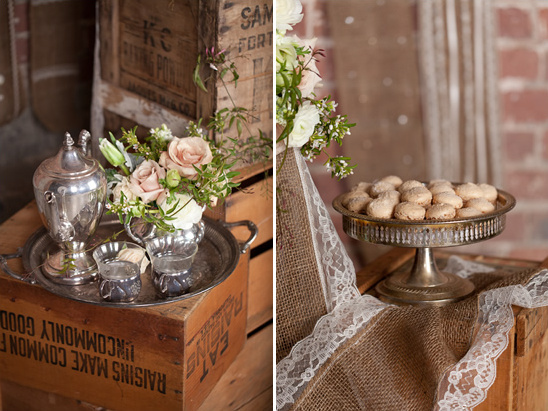 The beautiful table, mismatched chairs, sofa, apple crates and silverware came from Vintage Ambiance, a NW vintage rentals service. 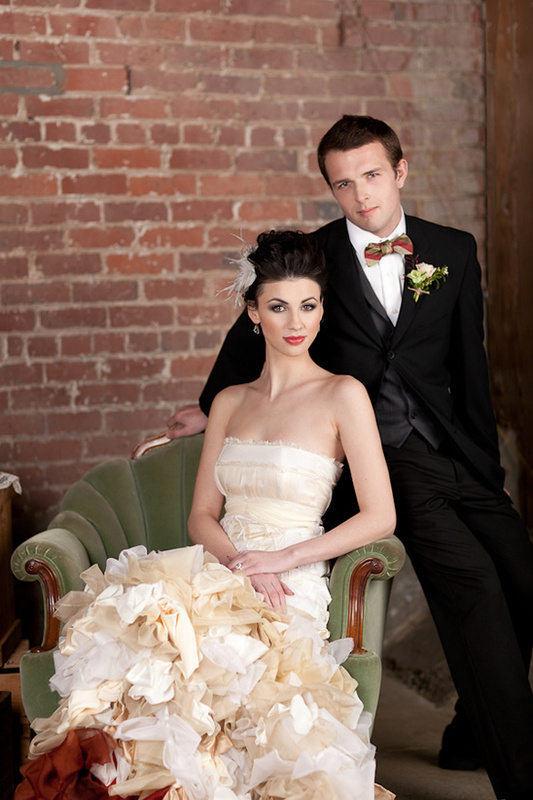 They have a huge range of vintage furniture, props and tabletop pieces and I use them for many of my weddings. 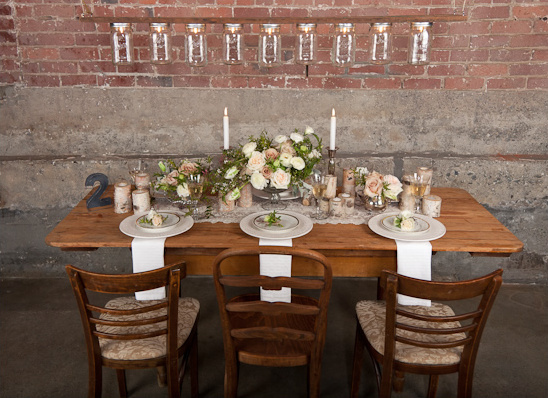 Abbey’s assistant, Heather Dow, sewed a burlap and lace backdrop and made a rustic mason jar chandelier that completely transformed the space. 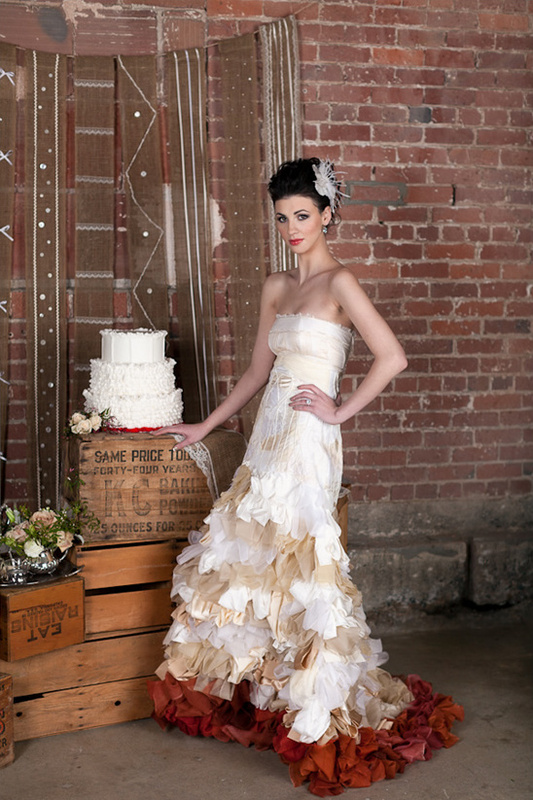 Jenny Bowker styled the models and created romantic and dramatic hair and makeup looks to coordinate with the dresses. You can check out Jenny’s video library on YouTube for lots of wonderful makeup tutorials. 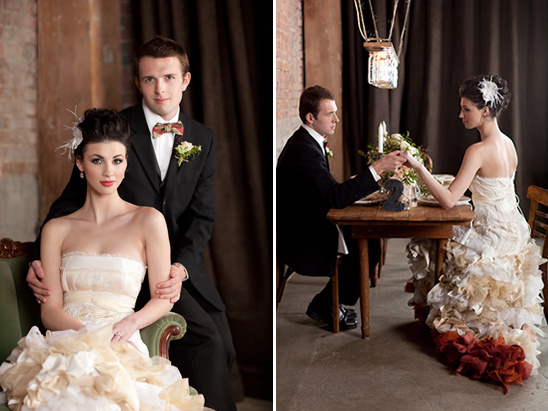 As you may have guessed already, Finch & Thistle Event Design is one our Hand-Picked wedding vendors. 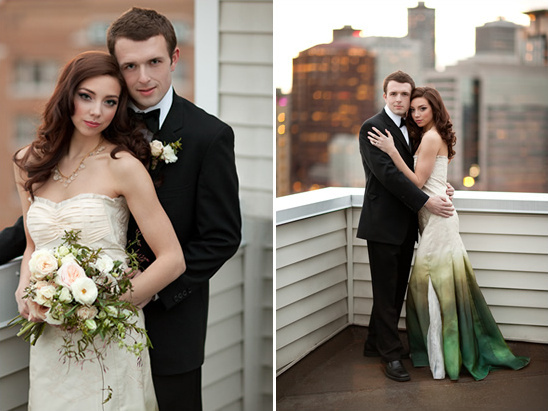 You must visit their Hand-Picked page to see more of their stunning work.